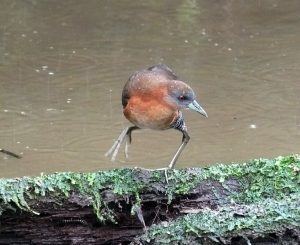 Visit the Fortuna Nature Trail: Also known as the “Sendero Bogarin” or just “Bogarin”, this oasis is an absolute must visit for ANY birder wearing binos around La Fortuna. Thanks to the dedication, perseverance, and hard work of local guide and naturalist Geovanni Bogarin, you can walk a good, easy trail through second growth and wet areas that host the most reliable Uniform Crakes on the planet, and dozens of other bird species. The presence of everything from Rufous-tailed Jacamars to Rufous-winged Woodpecker, Barred Antshrike, Long-billed Gnatwren, Black-crested Coquette, and other species is testament to what can happen when you just let the vegetation grow. The fact that most of the trail used to be pasture that now hosts wintering Golden-winged, Hooded, Chestnut-sided, and Mourning Warblers also provides hope for restoration of winter habitat for migrant species. Check out my eBird list from a recent, short visit. Oh yeah, and if you like to take pictures, the feeders can be sort of unbelievable. This was at the feeder last weekend. And White-throated Crake along with around 20 other species. This trail is just outside of La Fortuna, on the gravel road that runs next to the Backpackers Hostel. I’m not sure what Geovanni charges but please be generous with donations, he is doing this on his own and for the love of nature. 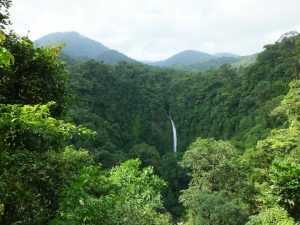 Visit the Waterfall: Another trail just outside of town, despite the constant stream of tourists both local and foreign, the site will probably surprise you with its excellent birding. The road in passes through birdy fields, second growth, and riparian zones, and the parking lot for the trail can be good for toucans (even Yellow-eared was showing well a few months ago), woodpeckers, and lots of other possibilities. Check the lights near the forest in the early morning for White-whiskered Puffbirds and other birds in search of easy insect prey. On the trail itself (which might not open until 8 a.m.) check for raptors and perched canopy species from the overlook, and watch for antbirds, great mixed flocks, and even Lanceolated Monklet on the steps down towards the waterfall. You might even see umbrellabird, two were recently seen there during this year’s Christmas Count! This trail costs $10 to enter, and although it consists of steps, you will be walking on metal and concrete ones instead of dealing with treacherous, slippery mud. Bird the hotel grounds: Bird are where the habitat is. Whether the hotel has a garden or some forest, check it out, you might be surprised at what you find. Bird the road to the Observatory Lodge: This is also the bumpy road that leads to the national park. Although the national park is alright, the road to the lodge and then to El Castillo tends to be excellent and reliable for Bare-crowned Antbird, other antbird species, raptors, and so on and so on. Check the rivers for Fasciated Tiger-Heron, and maybe Sunbittern, and just keep watching. 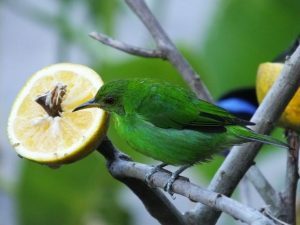 Don’t be surprised if you see a rare Lovely Cotinga at a busy fruiting tree, Bicolored and Semiplumbeous Hawks, and Rufous-winged Tanager. Access excellent forest at Skytrek, the Observatory Lodge, and Mistico: There are other trails in the area but these have some of the best forest. Mistico has Hanging Bridges and a hummingbird garden with Snowcap. The Observatory Lodge has good trails in good forest with great mixed flocks and chances at many forest birds. Skytrek is pricey but also has good trails through some of the best forest, a couple hanging bridges, and a fair chance at Black-headed Antthrush, Ornate Hawk-Eagle, and many other species including rarities like Sharpbill, Yellow-eared Toucanet, and other goodies. 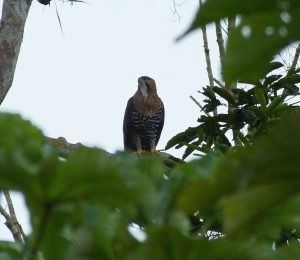 There are healthy populations of Orante Hawk-Eagle around Arenal. Geovanni has even seen it catch a squirrel on his trail! Enjoy your birding time around Arenal! 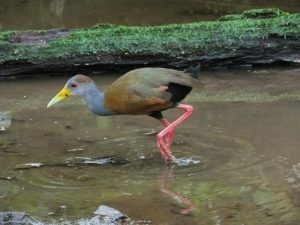 To see more information about sites throughout the country as well as information to find and identify bird species in Costa Rica, check out my 700 plus page e-book, “How to See, Find, and Identify Birds in Costa Rica”. Wow, that’s in impressive list of birds for Sendero Bogarín, especially for a visit at 2:00 in the afternoon! We’re definitely going to add that to our list of birding locations for our upcoming visit to the Arenal area. A visit there is always worth it!